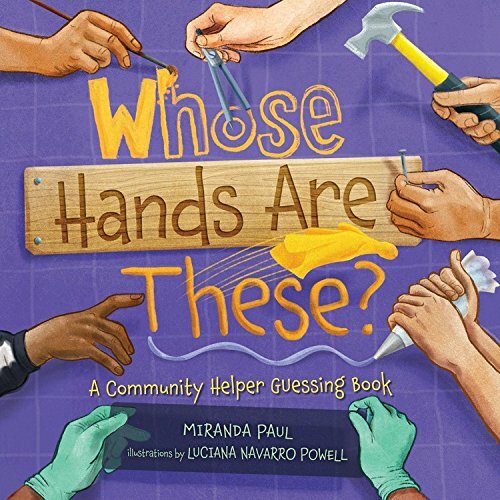 With delightful rhyme, the author creates a guessing game for eleven different jobs vital and familiar to all communities. But hands can help – so raise yours please! Each occupation is described perfectly for kids, starting with the hoeing and sowing, soiled hands of farmers. Then on to the sticky hands of cooks and the peacekeeping hands of police. Scientists, potters, news reporters, mechanics, architects, referees, physicians, and teachers are also highlighted. In the end, readers are asked what their hands will do. Powell’s realistic, but entertaining illustrations give life to the occupations described by Paul. Each section shows vignettes of hands doing the jobs, and the tools used, that the reader needs to guess. At the end of each section, there is a full-page depiction of several individuals doing the job. Second graders should be able to handle most of the reading activities, especially in context. This would also be a fun read aloud with younger kids, who would undoubtedly love to shout the answers. Extras: Many Kinds of Helping Hands goes into more detail about each job.